Relive the saga of Ryo Hazuki as he embarks on a quest to find his father's killers. 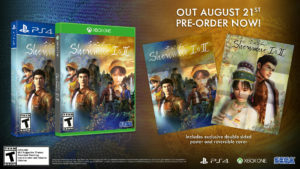 The highly anticipated remasters of the beloved Dreamcast games, Shenmue I & II, will now reach the market on August 21st. The games were announced back in April of 2018 during the ‘SEGA FES’ event. The games are said to run at 30fps and all content from the original game will not be cut. As a pre-order bonus, an exclusive double-sided poster will be made available for those who pre-order the Xbox One and PlayStation 4 versions. Shenmue I & II will be available on Xbox One, PlayStation 4 and PC on August 21, 2018. For more information, visit shenmue.sega.com.